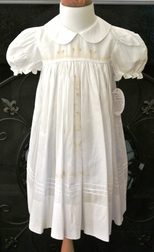 A gorgeous heirloom dress for your little girl for weddings, portraits, holidays or any other special occasion. The dress is made of a very delicate cotton batiste. The neck is made with a pretty Peter Pan collar. The bodice and the skirt are hand embroidered with ecru rosebuds, a floral spray, and a big beautiful bow. 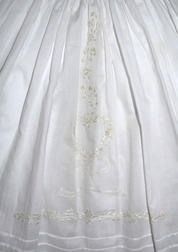 The bottom of the gown is embellished with small pleats.